After seeing the “Largest Ball of Twine in Minnesota” made most famous by Weird Al, and defined specifically as the world’s “largest ball of twine completed by one man,” we were VERY excited to see what is billed as simply “the largest ball of twine” in the world. After what seemed like forever in the ever-so-gas-efficient RV, we finally rolled into Cawker City, Kansas. While we weren’t surprised at how tiny this little town was, it was a bit depressing to see how, well, depressed the town was. Broken, dusty windows, empty streets and uncut grass are probably cleaned up for the annual “Twine Fest,” but today the town’s daily drab was fully on display, which I have to admit will probably jade our perspective a bit. With that said, we parked LaFawnduh, hopped out and walked towards the open gazebo that houses the twine. We could actually smell the twine fibers as we strolled up the stairs, and my allergies began protesting almost immediately with some sniffling and a few sneezes. Once in front of the twine it was clear that this was less a “ball” of twine as it is a “blob” of twine. Unlike the Minnesota ball, this pile is not regularly turned and as a result has settled into a mound of yellow. However, the story behind these dueling balls is quite interesting. In 1953, farmer Frank Stoeber began rolling twine, and kept rolling. By 1957, his ball in Cawker City weighed 2.5 tons and stood over 8-ft. tall. Simultaneously, in Darwin, Minnesota, Francis A. Johnson, who had been rolling a ball of his own for a year longer had gathered some interest of his own, and the race was officially on. Back and fourth they went until Stoeber stopped rolling in 1960 and handed his ball over to the city to manage. He died in 1974, but Johnson continued rolling. 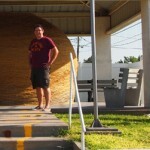 While Darwin’s 12-ft. diameter ball continues as a celebrated town shrine, and not an inch of twine has been added that wasn’t wrapped by Johnson’s own hands, the ball in Cawker continues to have strands added every year. In our opinion, advantage Darwin. And anyway, we much prefer our ball to be more, “ball-like.” But, we suggest seeing them both so you can decide.